I've been sitting on a review of The Song of Achilles for some time now. And it's simply another case of me worrying I won't do justice not just to the book, but to (perhaps even more importantly) my feelings for the book. I was attempting to do just that a number of nights ago with a friend, and wound up choked up and slipping the tears from my eyes as I touched on a scene of inevitable sorrow. My emotions continue to ride ever so close to the surface with this book, with Patroclus and Achilles. I stayed away from Madeline Miller's debut novel for awhile for several reasons, among them my fear of said sorrow as well as the usual concern when one comes to a retelling of characters and stories one loves. But eventually that cover—the gold foil, you guys, the glorious gold foil—and the parade of ecstatic reviews got to me enough that I grabbed a copy the next time I was at the library and settled down that night to see. Patroclus has always led the uneasiest of lives. Disparaged for his slight build and his relative weakness in comparison to his father, he has been a somewhat second-class citizen in his own father's court. Then one day an accident occurs and a young nobleman dies as a result. Patroclus is deemed at fault and so is exiled to be fostered in the realm of the legendary King Peleus. It is there that he meets Peleus' song Achilles. Achilles is everything Patroclus wishes he could be, bright and brave and the most talented of warriors where Patroclus is dull and shy and physically inferior. Which is why no one is more shocked than Patroclus when Achilles takes him as his personal companion. And so the two young boys form the fastest of friendships as they live together, train together, and run wild through the olive groves together. But through it all they can never seem to escape the shadow of the coming war or the prophecy that Achilles would go on to become the greatest hero the Greeks had ever known. If I had had words to speak such a thing, I would have. But there were none that seemed big enough for it, to hold that swelling truth. "Patroclus," he said. He was always better with words than I. This is the part where I confess I was vastly unprepared for the depth of feeling this novel would incite. I have been enamored of Greek mythology basically as far back as I can remember, and I recall with perfect clarity the chills that ran down my spine the first time I read the opening lines of The Iliad. I've read a number of retellings since, but I realized few of them worked hard to make Achilles sympathetic. Or at least more sympathetic than Hector. And while each incarnation left me impressed with Achilles' grandeur, I remained always firmly in Hector's camp. The Song of Achilles is told entirely from Patroclus' perspective, and his mind is as sharp and perceptive as his friend's body is honed and agile. The result is an extremely nuanced portrait of both young men. I savored the opportunity to watch them grow up together, to see Achilles handle the heavy layers of expectation and destiny, to watch how he dealt with his human father and his immortal mother. Thetis is a force to be reckoned with and I, like Patroclus, worried about the depth of her influence over Achilles. As ever with this epic tale, the question of which force will hold sway in the end is a desperate one. 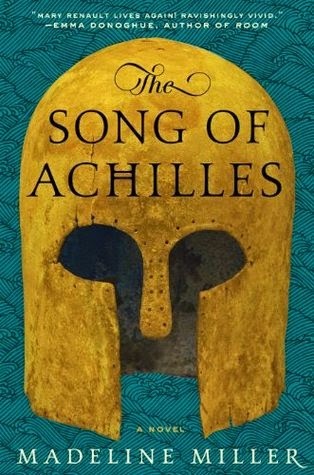 It's impossible to shake the feeling of dread while reading, but Miller does such a fine job of allowing you to soak up those golden moments leading up to the war, to come to know and love both Achilles and Patroclus enough that you understand why they make the choices they do in the end. And I can honestly say that my knowing what was coming in no way impeded my experience, the words were that expertly chosen and woven together with a level of skill that left my cup full to the brim. The sorrow was so large it threatened to tear through my skin. When he died, all things swift and beautiful and bright would be buried with him. I opened my mouth, but it was too late. "I will go," he said. "I will go to Troy." The never-ending ache of love and sorrow. Perhaps in some other life I could have refused, could have torn my hair and screamed, and made him face his choice alone. But not in this one. What an exquisite agony reading The Song of Achilles was. I wept more than once. But the sorrow was handled well, in such a way as to allow it its full and brutal impact before winding to a close so beautiful I felt the breath leave my lungs. How I loved them. Patroclus and his brilliant Achilles. The Allure of Books - "If you’re interested in mythology, war or just a great love story – pick this up and prepare to be amazed." The Book Smugglers - "My own plea is that you read this book immediately."